Today in nightmare fuel: scientists now believe bat-eating spiders to be more widely distributed around the globe than previously realized. According to newly published research, bat-predation by spiders has been observed on every continent on Earth — Antarctica being the sole exception. As if this video evidence that spiders can eat 18-inch-long snakes weren't harrowing enough. In a study recounted in the latest issue of PLOS ONE (available free of charge), researchers conducted an extensive search of existing information pertaining to bat-hunting spiders: scientific literature; staff members from bat hospitals around the world; fellow scientists, with specialization in bats and spiders; even flickr, and bloggers who had posted photographs of bat-catching spiders on the internet — all were consulted in an effort to compile the most exhaustive record ever of bat-catching spiders. All told, the researchers gathered 52 reports on bat-catching spiders — only 23 of which had previously been published. 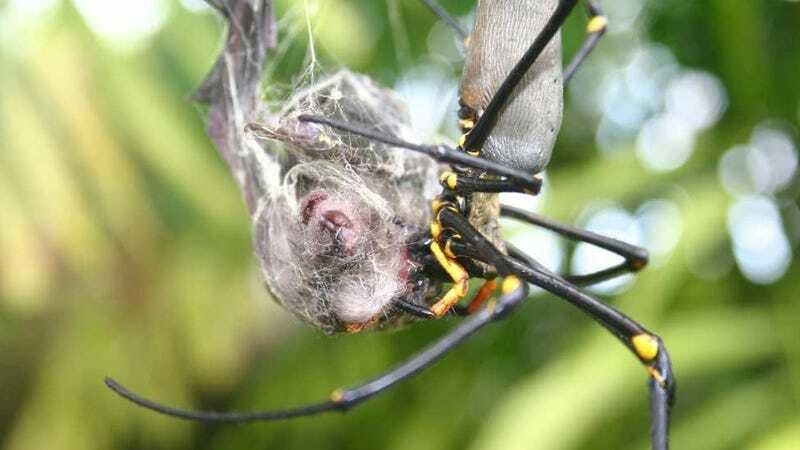 While in some instances bats entangled in spider webs may have died of exhaustion, starvation, dehydration, and/or hyperthermia (i.e., non-predation death), there were numerous other instances where spiders were seen actively attacking, killing, and eating the captured bats (i.e., predation). This evidence suggests that spider predation on flying vertebrates is more widespread than previously assumed. The researchers' findings are published free of charge in the latest issue of PLOS ONE.